Despite being a fully fledged Dividend Aristocrat in its own right it’s quite surprising how little coverage medical equipment company C.R. Bard (NYSE: BCR) gets on financial media sites. Over the past twelve months for example there have been just three articles written about Bard stock on Seeking Alpha. Part of the reason for that is simply that it is less well known compared to more famous healthcare aristocrats like Johnson & Johnson and Abbott Labs. The other reason is probably down to the perpetually low dividend yield. Over the past fifteen years it has averaged a measly 0.9%. If you were looking for stodgy dividends in the healthcare sector then you could’ve picked up greater than 3% yields in Johnson & Johnson stock at various times since the financial crisis hit in 2008. Same deal for Abbott Labs stock. When you get that situation of perpetually low dividend yields there’s a few ways you could look at it. The first is that it may just be insanely overvalued – think Coke stock back in the late-1990s when the average dividend yield was under 1% for instance. The second is that whilst the initial yield looks low you’ve got the prospect of fantastic rates of growth that mean you can build a relatively high yield on cost quite quickly. If you bought Starbucks stock at this point in 2010 for example you’d have been looking at an initial dividend yield of about 1.7%. Today the yield on cost of that investment would be in the 5.5% region down to their blockbuster rate of earnings and dividend growth. The third possibility, which looks to be the case with C.R. Bard stock, is that the dividends just don’t form a huge part of shareholder returns. Since 2000 the average annual P/E ratio has been 18.5x earnings. Now back then Bard were reporting earnings-per-share of $1.22. In this financial year they are on course to report around $10 per-share in net income. Overall that works out to average compounded earnings-per-share growth of 14%, so it’s very much in that Starbucks/Nike category of having a perpetually fairly “high” valuation that has continually been supported by a high earnings growth rate. The thing with Bard stock though is that dividends have actually become less important to the total returns over that time frame. Let’s say you invested $100,000 in Bard stock at the turn of the century. Unlike a host of other high quality healthcare blue chips back then Bard wasn’t particularly caught up in the dot-com era bubble. Whereas you would’ve had to fork out 25x earnings for the likes of Johnson & Johnson and Abbott Labs – and as much as 40x earnings for a big pharmaceutical stock like Pfizer – you could pick up C.R. Bard stock for around 20x earnings with a 1.6% dividend yield. 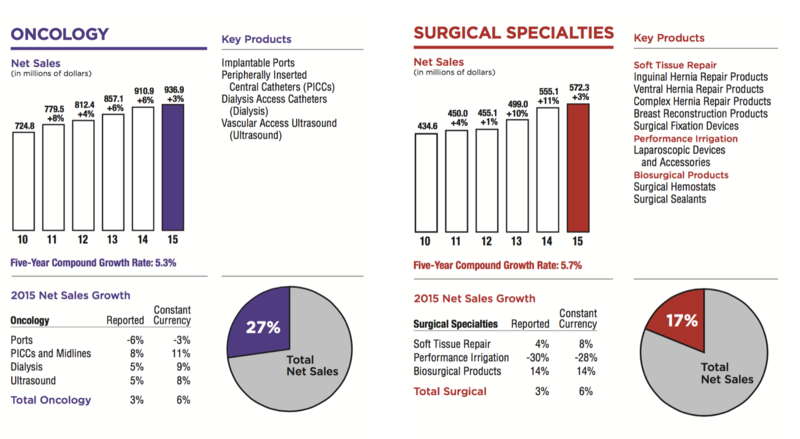 Now the thing with Bard as a company is that it operates exclusively in medical equipment. 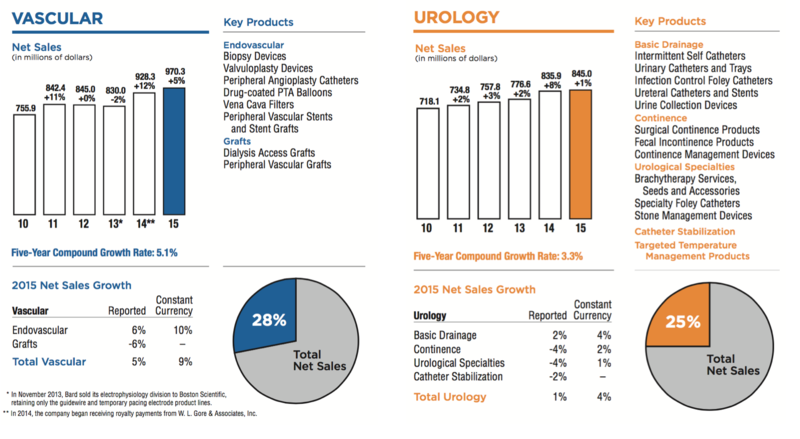 Their operating segments are listed as Vasicular, Urology, Ocology and Surgical Specialities with a pretty even split between the four in terms of sales. Basically they sell things like catheters and stents to hospitals, with their competitive advantage deriving from high quality patent protected products. That gives it relative degree of stability with respect to revenues earnings that you might not get with the big pharmaceutical stocks. It’s not on the same scale as Johnson & Johnson (it’s ten times smaller after all), but selling primarily single use items gives it a fairly stable recurring revenue. If you don’t want to deal with drug makers and all that entails – evaluating drug discovery pipelines etc – then Bard is worth a look. Anyway, back to this investment in Bard stock. In the first year you’re looking at earnings of $1.22 a share, of which the annual dividend of $0.41 represents 33%. In year one you collect a total of around $1,565 in dividend income based on an initial investment at $26.15 a share. As the years roll on the annual earnings keep on rising at a steady clip. By 2006 they are at $3.51 per-share, representing compounded annual growth of 19.3% a year. The dividends though only rise by 4.7% a year – so that by 2006 your yield on cost of 2% is only throwing off $2,000 in dividend cash. Just like Abbott Labs the earnings increase in every single year of the financial crisis – as do the dividends and stock buybacks – giving you the luxury of not having to worry too much as the world economy is seemingly going down the drain. This year you are looking at earnings-per-share of around the $10 mark, with the current normalised P/E ratio of 21.5x being almost identical to the starting valuation back in 2000. So in other words all the capital gains have come from underlying earnings-per-share growth rather than an expanding value multiple. A $100,000 investment, which would’ve netted about 3,825 shares back in 2000, would be worth approximately $820,000 based on today’s share price of $215. The thing is though that the dividend yield on cost would only be about 3.70% for this financial year. It’s a funny stock for dividend investing as the distribution is such a small part of total returns, with management basically prioritising boosting earnings through periodic buybacks and acquisitions. As dividend aristocrats go it’s rare in that respect. The upshot is that income investors probably won’t ever need to look at the stock. Why pass up a low-growing juicy 4% yield in something like Sanofi, for example, for a low growing 0.5% yield in C.R. Bard stock? Should You Buy C.R. Bard Stock Right Now? At the moment the shareholder yield is in the 4% region with most of that going on stock buybacks. Even if they increased the mix and the dividends came to represent 50% of net income you’d only be looking at a yield of 2.5%. Now if it’s just about looking for reliable current income, along with the prospect of good future growth, then I’d rather just buy a current 2.8% yield in Johnson & Johnson covered comfortably by earnings to be honest. If you wanted to compare it to a direct competitor then look at Becton Dickinson stock. They’ve raised the dividend every year since the mid-1960s, report similarly high quality profits and also operate in medical equipment and supplies. At the moment Becton stock trades at somewhere around 19x forward earnings with a 1.6% dividend yield only taking up 30% of said earnings. Both stocks likely have similar long-term organic growth profiles and shareholder returns. An investor more inclined toward dividend policy would probably plump for Becton Dickinson though – with a good possibility that double digit dividend growth will be easily achievable over the medium-term. That’s the income investing angle. From a total return perspective at 21x earnings you’re probably somewhere in the fair value area for Bard right now considering it’s roughly the same value multiple as back in 2000. That puts it in the position where you can factor in some contraction of the valuation multiple and still see a scenario that produces decent returns over the long-term, even if doesn’t quite match the huge 14% annual compounded returns that shareholders have enjoyed over the past fifteen or so years.